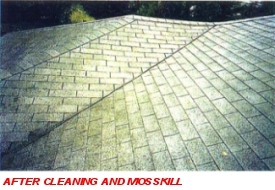 Roofs are blown free of any debris with compressed air - not a leaf blower. Move Your Mouse Over Pictures to see "Before Cleaning"
Cleaning of the rain gutters and downspouts is a critical part of home maintenance. 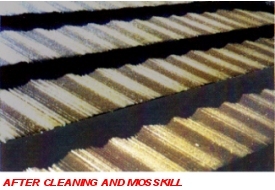 Clean gutter systems function to achieve maximum efficiency. 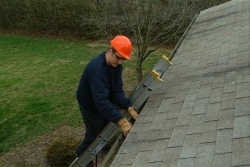 Our teams make sure all debris are removed from gutters and down spouts. 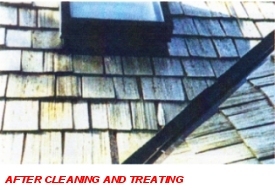 The gutters, siding and grounds are left clean and spotless. The debris are bagged and left in an appropriate place. Underground gutter drains should be checked every time you clean gutters. If you maintain your underground drains regularly, it will prolong the life of your foundation. We use an industrial rooter tool to attempt to clear the underground drain. 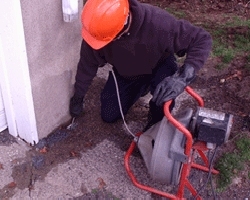 If a drain cannot be cleared, an estimate for repair will be given.